Starbucks You Are Here Series is expanding again! Please meet YAH Phnom Penh mug. As it was announced at the Official Cambodia Facebook page it will be available for sale on October 7 at their Flagship Store. So far we can only see one side of the mug, where Independence Monument is portrayed. The monument was built in 1958 to commemorate Cambodia’s independence from France in 1953. It is the center of activity, where a ceremonial flame is often lit by a royal or high official during national celebrations. Lucky you, who will be visiting Cambodia soon. I believe it will also be available at the Phnom Penh International Airport. Check it out first things first when landing in Cambodia. 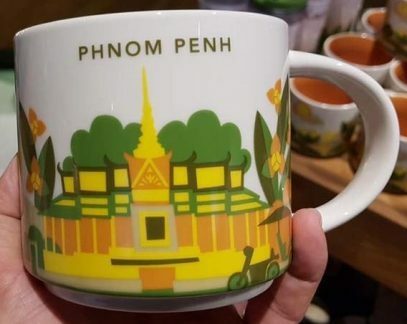 Update: the actual name of the mug will be Phnom Penh and not Cambodia. As seen from the newly released picture they placed the Moonlight Pavilion on the other side of the mug. This architectural masterpiece is one of the buildings forming the complex of the Royal Palace. Another interesting detail is the scooter – the most common transportation in Phnom Penh and all Cambodia, I believe. The inside of the mug is orange.